iately con-nected with the Optic nerve, which, in fact, terminates in tbem, and aretherefore to be considered (like the chief part of the cephalic masses of In-vertebrated animals) as Optic Ganglia. In front of these are the CerebralHemispheres, which are small, generally destitute of convolutions, andpossess no ventricle in their interior, except in the Sharks and Rays, inwhich they are much more highly developed than in the Osseous Fishes.Anterior to these is another pair of ganglionic enlargements, from which theOlfactory nerves arise; and these are, therefore, correctly designated as theOlfactive tubercles or ganglia. 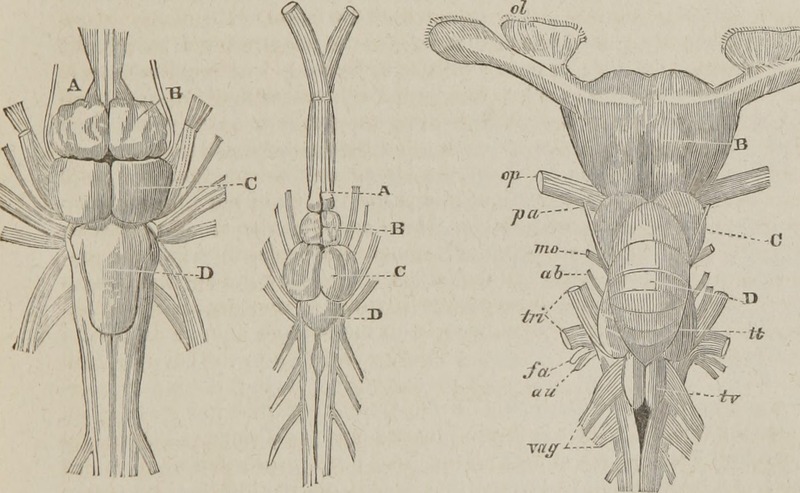 In some instances, these ganglia are notimmediately seated upon the prolonged spinal cord, but are connected withit by long peduncles; this is the case in the Sharks: and we are thus led toperceive the real nature of the portion of the trunk of the Olfactory nerve inMan, which lies within the cranium, and of its bulbous expansion on the Fig. 17. Pike. Cod. Fox-Shark.